Anomalous origin of the right coronary artery from the pulmonary artery (ARCAPA) associated with the aortopulmonary window is a very rare entity. Ventricular ischemia due to coronary steal caused by ARCAPA may be worsened by the aortic runoff due to the aortopulmonary window. In this case report, we describe one such case. A 10-month-old female baby presented to us with a history of difficulty in feeding, failure to thrive, excessive crying, and increased precordial activity as noticed by parents. She was found to have a continuous murmur in the left second intercostal space. Transthoracic echocardiography revealed an aortopulmonary window of 3 mm, anomalous origin of RCA from the anterior sinus of the pulmonary artery, and a small ostium secundum atrial septal defect. Cardiac computed tomography (CT) scan confirmed the same [Figure 1]. At surgery, main pulmonary artery was opened [Figure 2]. 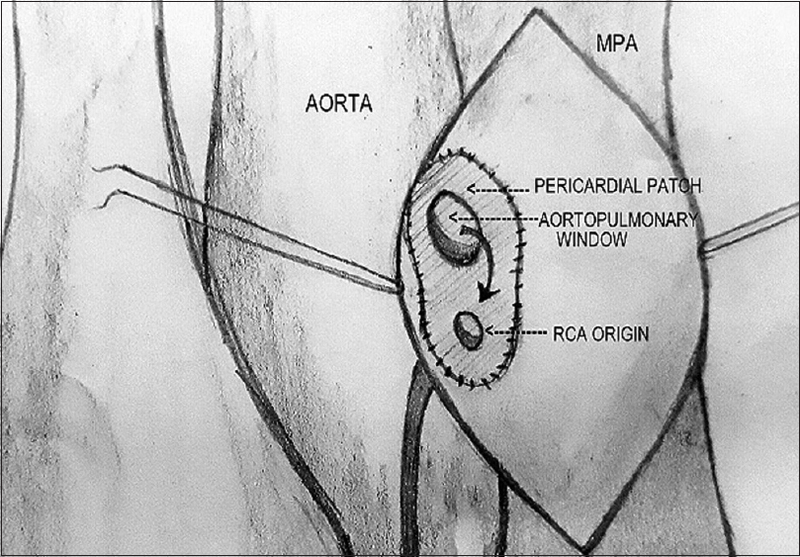 Opening of aortopulmonary window and ostium of RCA were side by side [Figure 3]. A pericardial patch was used to connect aortopulmonary window to RCA origin similar to Takeuchi procedure using fine 6-0 prolene continuous sutures, isolating both the openings from the pulmonary artery. 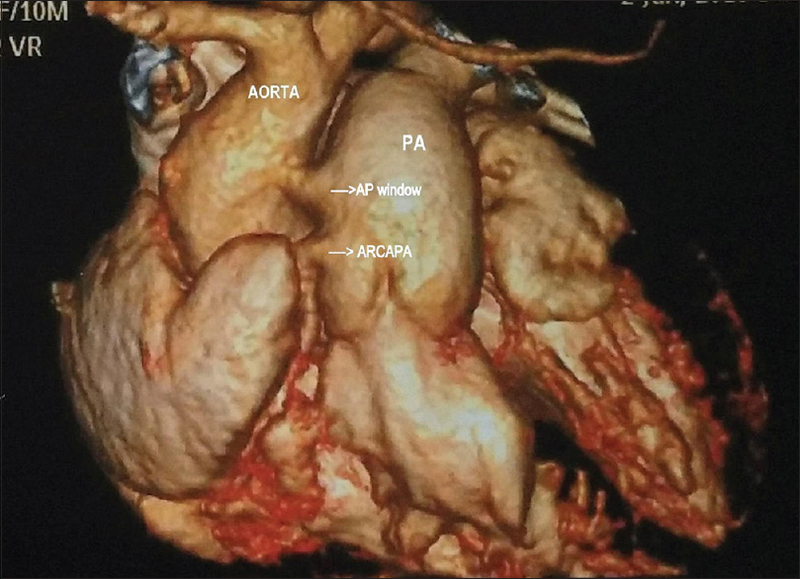 Intrapulmonary baffle using pericardial patch was performed to connect the origin of RCA to the ascending aorta through the aortopulmonary window. Atrial septal defect was closed. At 1-year follow-up, the patient is doing well. In 1945, Soloff described four variants of coronary artery anomalies arising from the pulmonary artery. These are anomalous origin of the left coronary artery from the pulmonary artery (ALCAPA), ARCAPA, both coronaries arising from the pulmonary artery, and finally, an accessory coronary artery arising from the pulmonary artery. Coronary artery anomalies are seen in 1.3% of the general population. Among these anomalies, ARCAPA is extremely rare with an incidence of 0.002% in the general population. These patients mostly remain asymptomatic and reach adulthood but may present with chest pain or congestive cardiac failure and occasionally sudden cardiac death. Sixty-six percent of the cases of ARCAPA are associated with other congenital disabilities such as aortopulmonary window, tetralogy of Fallot, ventricular septal defect, and aortic stenosis. In ARCAPA, collaterals develop between the high-pressure left coronary artery and the low-pressure right coronary artery, resulting in coronary “steal” and chronic myocardial ischemia with subsequent myocardial fibrosis. Chronic volume overload results in ventricular dysfunction. The severity of ventricular ischemia is determined by the size of the shunt, presence of collateral circulation, territory at risk, and demand. Since right ventricular oxygen demand is lower than that of the left ventricle, ventricular ischemia in ARCAPA is felt to be less common than in ALCAPA., This condition is well tolerated in the neonatal period due to high pulmonary vascular resistance. As pulmonary vascular resistance begins to fall, coronary steal begins to occur leading to ventricular ischemia. Electrocardiography in ARCAPA may be normal or may show left ventricular hypertrophy. Transthoracic echocardiography reveals an anomalous origin of the RCA. Cardiac CT scan, coronary angiography, and cardiac magnetic resonance imaging are other investigations for confirmation. Surgical correction is recommended whenever this anomaly is detected since it provides establishment of bicoronary circulation that allows for normalization of coronary flow reserve. Associated aortopulmonary window should also be closed. The aim is to eliminate both the left-to-right shunts to prevent myocardial ischemia. Direct reimplantation of the RCA to the aorta is favorable when RCA originates from the right or anterior aspect of the pulmonary artery. If it originates from the nonfacing sinus of the pulmonary artery, ligation and coronary bypass grafting, direct reimplantation after extensive mobilization, and creation of an intrapulmonary baffle (Takeuchi's procedure) are the available options. 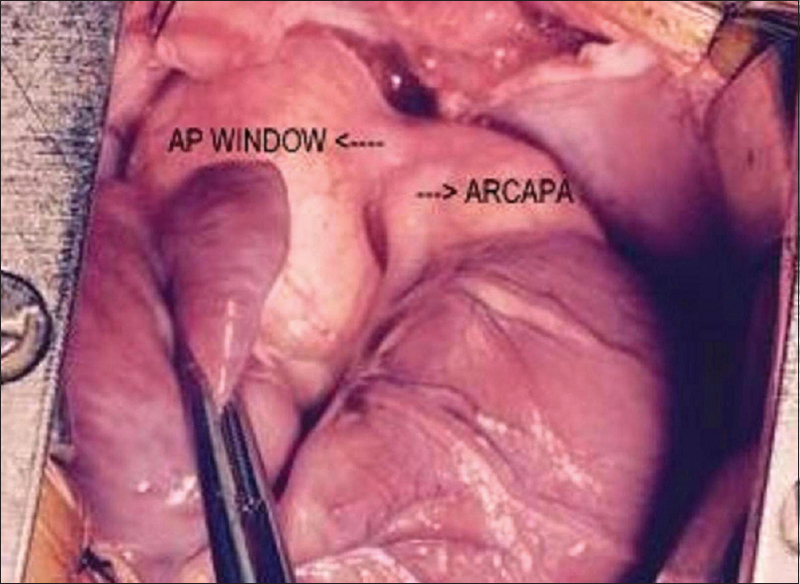 An ARCAPA associated with an aortopulmonary window is an extremely rare condition. Surgical correction to eliminate both the left-to-right shunts is recommended once the diagnosis is confirmed to prevent long-term consequences of myocardial ischemia due to coronary steal. In this case, it was successfully done by creating an intrapulmonary baffle using a pericardial patch. Soloff LA. Anomalous coronary arteries arising from the pulmonary artery. Am Heart J 1942;24:118-27. Williams IA, Gersony WM, Hellenbrand WE. Anomalous right coronary artery arising from the pulmonary artery: A report of 7 cases and a review of the literature. Am Heart J 2006;152:1004.e9-17. Mintz GS, Iskandrian AS, Bemis CE, Mundth ED, Owens JS. Myocardial ischemia in anomalous origin of the right coronary artery from the pulmonary trunk. Proof of a coronary steal. Am J Cardiol 1983;51:610-2. Hakim K, Boussaada R, Hamdi I, Ouarda F. Anomalous origin of the right coronary artery from the pulmonary artery. Two case reports. Egypt Heart J 2014;66:283-6. Luciani GB, Vendrametto F, Barozzi L, Oberhollenzer R, Pitscheider W, Mazzucco A, et al. Repair of anomalous right and circumflex coronary arteries arising from the pulmonary artery. J Thorac Cardiovasc Surg 2006;132:970-2.